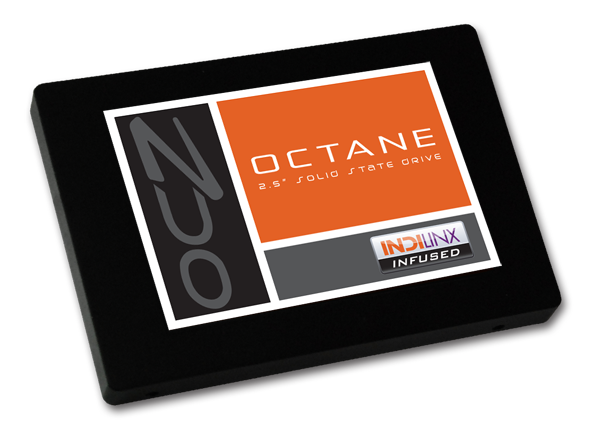 In March, OCZ signed a definitive agreement to acquire Indilinx, the SSD controller company that pretty much dominated the value segment in 2009 before Intel got aggressive on pricing and SandForce took over the high-end. Indilinx was late on releasing its 6Gbps SSD controller prior to the acquisition and had all but fallen off the radar as most of its partners jumped ship to SandForce. OCZ scooped up the company with hopes of developing its own controllers and rising above the memory-manufacturer-turned-SSD-player crowd. SandForce has obviously extended its reach since OCZ announced its intentions, partnering with many of OCZ's competitors in an attempt to expand its reach as well as lessen dependence on OCZ. As a customer turned competitor, SF like many of us knew that an OCZ SSD boasting a new Indilinx controller was in the works. Today we have the first details on that solution and it's called Octane. Based on the Indilinx Everest controller, OCZ is touting incompressible data and sustained write performance as the two major strengths of Octane - obviously a jab SandForce and traditional SSD weaknesses. The controller is paired up with up to a 512MB DRAM cache, indicating that it is taking the more traditional route of storing both user data as well as page mapping tables in DRAM. There's no mention of power protection circuitry to flush the cache contents to NAND in the event of a power failure, but given the target market for these drives I don't suppose we'll see such a feature. The Octane will be available in two discrete versions: one with 6Gbps SATA support and one limited to 3Gbps (SATA 3.0 and 2.0, respectively). The 6Gbps version will ship with 25nm IMFT synchronous NAND, while the 3Gbps version will use 25nm IMFT async NAND similar to the Vertex 3/Agility 3 divide today. Sequential read/write speeds are competitive at 560/400 MBps, while 4KB random read/write speeds are quoted at 45K/25K. Capacities start at 128GB and will go all the way up to 1TB. OCZ is expecting pricing to fall somewhere within the $1.10 - $1.30 per GB range, which would put a 128GB drive at no more than $166 (in line with current Vertex 2 pricing) and a 1TB drive at just over $1300. Spare area is set at the standard ~7% you get from the GiB to GB conversion. No word on whether or not there's any additional NAND set aside for redundancy. The Everest controller features 8 NAND channels and up to 16-way interleaving. With 25nm NAND that means peak performance should be achievable with the 128GB model, with the larger drives just offering higher capacity and no additional performance. TRIM is of course supported. OCZ indicates support for both standard wear leveling and background garbage collection (presumably at idle time). The first Octane drives will be available in the channel starting November 1st. I've already dispatched a huge list of questions to OCZ about the controller and the drive's architecture so I'll update this post as I get any new information. And of course, once we get a review sample I'll begin extensive testing. Yes, and Linux can do the same by mounting the filesystem as "sync" (synchronous). Doing so does sort of defeat a lot of the benefit of having a large data cache, though.